Garden Log Cabins - Who Has The Best? Garden log cabins can make a beautiful and highly practical addition to any garden, and by beautifying the property as a whole they could even add to its intrinsic value. 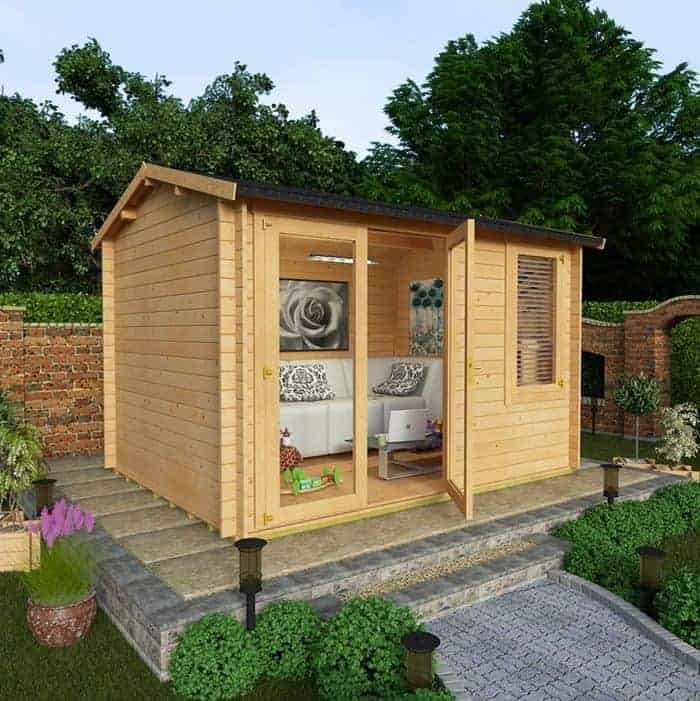 When you have a high quality garden cabin, you’ll always have a spacious area in which to relax after a hard day, or a place in which to entertain guests, or even to use as a home office or a craft workshop. With so many available, finding one that’s right for you can seem a difficult task. That’s why WhatShed have created this handy guide to the 20 best garden log cabins that can be bought online in the UK today. When researching garden log cabins, there were certainly many buildings to choose from. We looked at the price, and value for money, of each model, and we also considered any value adding features, as well as durability, looks and design quality. When compiling this league table, our first task was to define just what a garden log cabin was. The use of specially cut logs for cladding was one indicator, as was the use of chalet connectors to add stability and strength. We also wanted to place an emphasis, however, on cabins that would be suitable for ordinary domestic gardens, which is why we have only considered models that have a base area of less than five metres by five metres. This ruled out some of the very largest models, but even so, we have some models that are spacious and accommodating enough to meet almost any needs. We found a lot of high quality garden cabins to choose from, so whittling them down to a league table of the twenty best models was an exacting task. Special congratulations go to the Alpine Aspen plus garden cabin. It ticked all our boxes by being very attractive, large, relatively affordable, and having a long manufacturer’s guarantee, which is why it tops our list of the very best garden log cabins that can be bought online in the UK today. 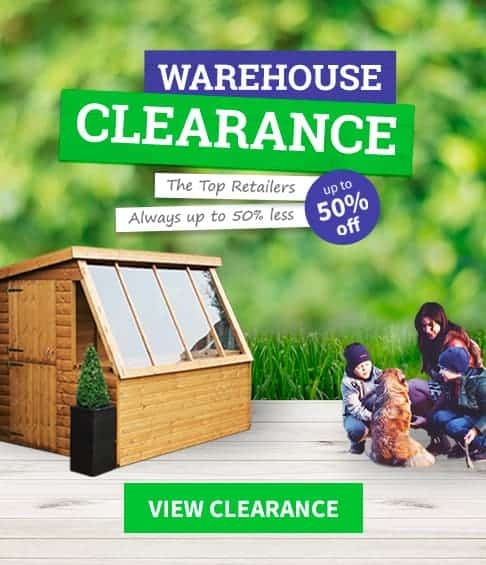 Whether you want log cabins or summer houses, sheds or garages, WhatShed bring you the independent reviews to help you make the right purchasing decision. Garden log cabins share a common usage of specially cut logs as their substrate, but in other aspects they can differ greatly. One of the primary reasons that this Alpine aspine garden cabin stood out from all the others was it’s sheer good looks. The Alpine style, complete with chalet connectors to give it added strength and stability, really caught our eye, and the Georgian style glazing adds further aesthetic appeal. This may not be one of the cheaper garden cabins here, but it is one of the largest, and so we feel it represents very good value for money. With a 10 year manufacturer’s warranty provided as well, this deservedly takes the top spot in our WhatShed league table. Another feature that helped this achieve top position in our list of the very best log cabins, is that it features a distinct and secure storage area. This area is accessible by its own single hinged door, as opposed to the glazed double doors at the front of the cabin, and there are no windows so passers by will have no idea of what’s being kept inside. We very rarely see this added to garden cabins, and it really adds value and versatility. With a base area of 5.00 x 3.00m as well, there’s still more than enough room inside for either leisure, entertaining, or work purposes. We always like to see garden log cabins that have a unique and yet stylish look of their very own, as that means they can become a feature of the garden in their own right that will impress neighbours and friends. That’s certainly the case with this Connor log cabin from Rowlinson. The right hand side is occupied by an enclosed cabin area that, with an overall area, of 2.46 x 4.92m, is still large enough to use as a place to relax in or as a home office. The double doors here are both glazed in a semi-circular fashion, so when the doors are closed it gives the appearance of a large porthole. The left hand side is open to the elements at the front, making it a perfect place for al fresco dining. It’s sure to impress guests at dinner parties, and we found it to be elegant and eye catching. The side panel at this open end is louvered, so it should feel very airy, and yet the cladding as a whole is still tough and durable. Unlike most of the garden log cabins in this list, this has tongue and groove cladding rather than traditional loglap, but at 19mm thick it still creates a sturdy and reliable structure. We were also pleased to find that it comes with a 10 year guarantee against rot, a value adding feature that we always welcome but don’t always find on the garden cabins we review. These are mid sized garden log cabins, with a base area of 2.99 x 2.99m, and yet with the apex roof reaching up to a peak height of 2.39m they should still feel spacious and welcoming inside. 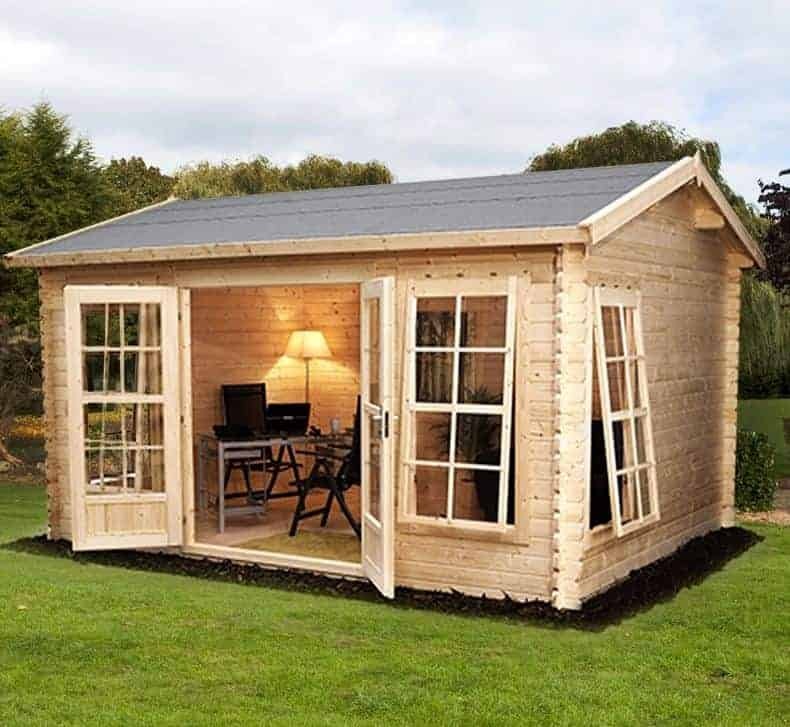 This relatively compact size when compared to many of the other garden cabins in our league table also makes it ideal for people who want the flexibility and durability that they typically offer, but don’t have too much space on their lawn on which to accommodate one. 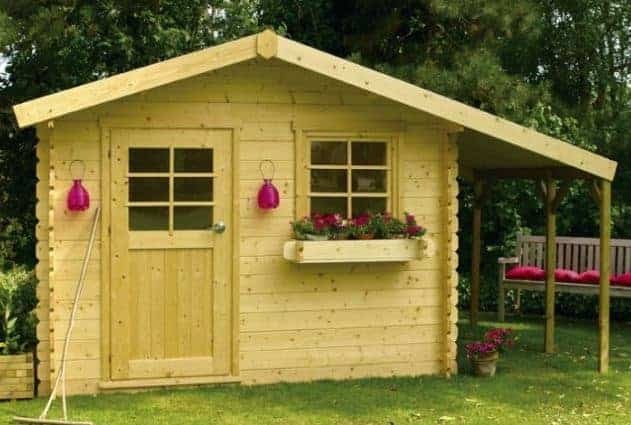 Stylistically this looks much more like a typical shed than most other garden log cabins we’ve reviewed, but it can still be an attractive addition to the garden once painted or stained. It is constructed, however, of interlocking logs which is why it’s been considered for our list. We were pleased to find that a 10 year warranty is supplied with the building, giving added reassurance as well as added value. This is also true of the window which features toughened glass, and is therefore very difficult to break. 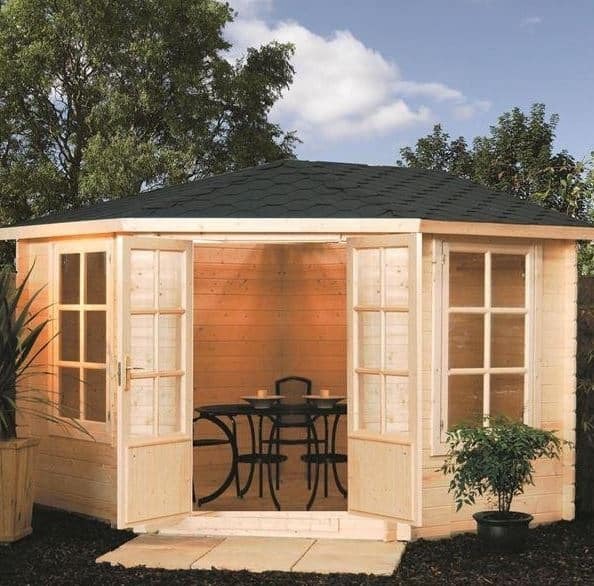 Indeed, this is one of the best value garden cabins we’ve reviewed, with an asking price of less than eight hundred and fifty pounds and it’s this that takes this garden cabin into our top three, above larger and more decorative cabins. This is the second of the garden log cabins from the Alpine range to occupy a position inside our top four, and we were pleased to find that it has a different appearance it shares many of the traits that we rated so highly in the Aspen Plus model that tops our table. Once again this is very generously sized, this time with a base area of 4.00 x 3.00m. This is smaller than the earlier model, however, and as it comes at the same price this accounts for their relative positioning within our rankings. We were also impressed by just how tough and sturdy this is, with the 28mm interlocking logs being thicker than we see used on many of the garden log cabins we review. Once again they are given a 10 year guarantee, which shows how confident the manufacturer is in this building’s resistance to rot. The integrated pressure treated floor joists help with this, as they greatly reduce the threat posed by ground moisture. We liked the reverse apex design of this garden cabin as well, and the wide opening double doors, which we were glad to find come with a key operated lock as standard, and opening windows should make this as airy as it is attractive. 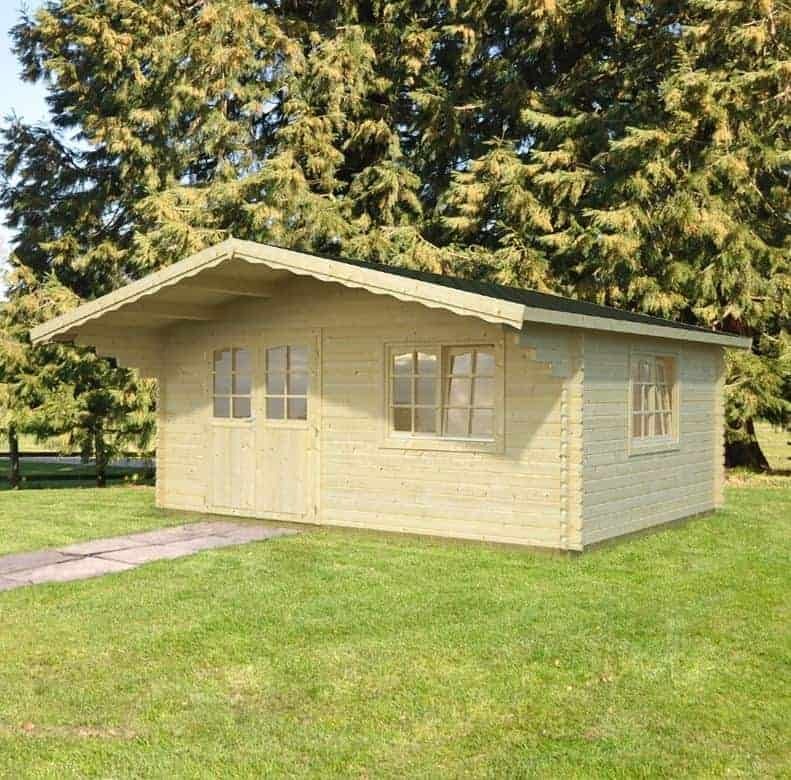 There were two things that struck us immediately about these garden log cabins: the first was the chalet style design that’s very pleasing on the eye thanks to the use of high quality components throughout, and the second was the sheer size of it. With a base area of 4.22 x 4.72m this is one of the largest garden cabins in our league table, and as it is also protected by a 10 year guarantee, we think that whilst the price tag of nearly twenty eight hundred pounds may put it out of the reach of some, it still represents reasonable value for money. This is certainly a garden log cabin that will impress any guests you have, and we especially liked the overhanging roof and the veranda underneath it. It’s a perfect place to dine outside, while still being protected from the elements. We also liked the shingle covering on the roof, which are both very durable and very stylish. The apex roof itself is one of the shallowest that we’ve seen, and yet the ridge height of 2.70m is still very accommodating so you certainly won’t have to bend down when walking around or when going through the glazed double doors which we were pleased to see can be securely locked. 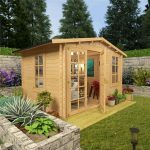 Garden log cabins are typically among the largest garden buildings that we review, as well as some of the most practical and attractive, but what do you do if you’re garden just isn’t large enough to accommodate a standard sized cabin? Rowlinson have the answer with this smart Kestrel corner garden cabin. Once inside the interior should still feel roomy, being based upon an area of 3.25 x 3.25m. The difference is that this is spread over a five sided design, which means that it can fit neatly into the corner of any garden. It’s a space saving feature that makes this an ideal choice for people with a smaller garden where space is at a premium. The unique pentagonal design of these garden log cabins doesn’t make them any less attractive, and we particularly liked the eye catching shingles on the roof. They’re also very effective at keeping rainwater out, as are the 28mm thick logs used for the cladding. This not only keeps the contents within dry, it can also help in the fight against rot. It’s one of the reasons that the manufacturer has been able to supply a 10 year warranty, and this is always something that we like to see even though it is dependent upon the owner carrying out annual preservative re-treatments. 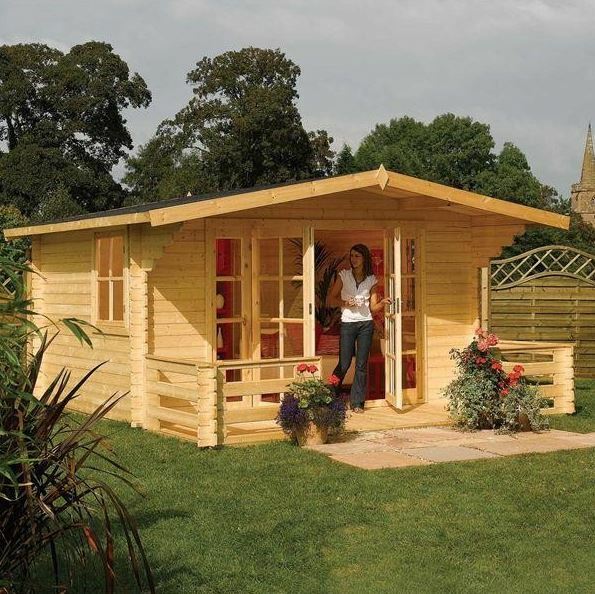 These garden log cabins are solid in nature as well as by name, thanks to the use of 28mm interlocking logs. It means that once assembled this log cabin should feel very strong and sturdy, and as long as it’s given regular treatments with wood preserver the use of high quality components means that it should prove a durable addition to the garden. We would have liked to see a manufacturer’s warranty to back this up, and whilst the lack of one has prevented this from achieving an even higher position, it’s certainly not uncommon in the garden cabins we’ve reviewed. One feature unique to these garden log cabins is an integrated log store, and we were pleased to find that this could be positioned on either the right or the left so that it can be tailored to suit an individual garden. More and more people are using logs as a greener source of household fuel, which is why this log store can prove a very handy addition to what is a very good looking garden cabin. The overhanging apex roof protects the logs from direct rainfall, whilst the open sides give the ventilation that logs need. 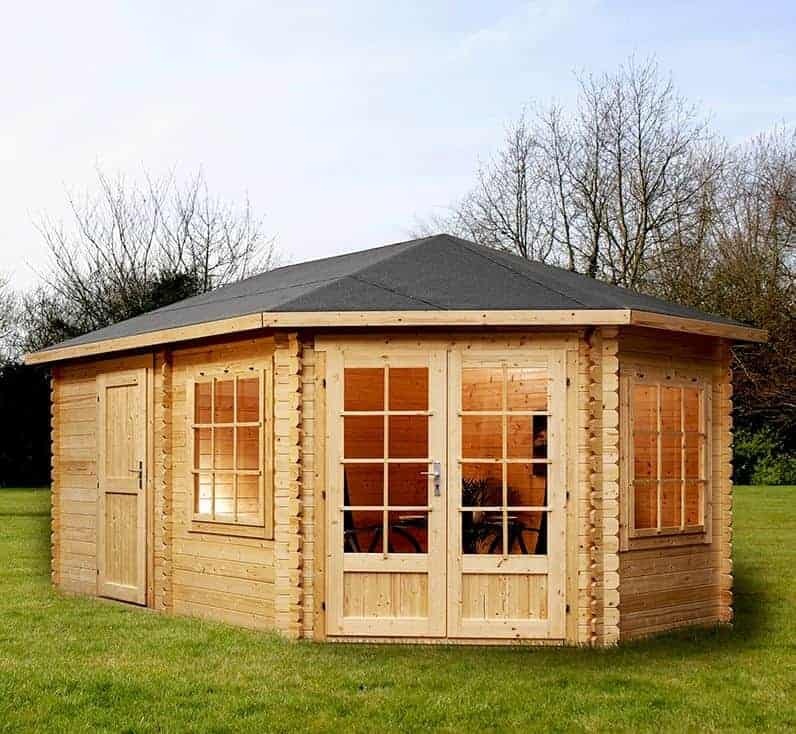 If you do have a log burning stove, or are thinking of buying one, then this could be the ideal garden log cabin for you, and we feel it’s very good value for a base are of 2.98 x 1.98m. With a base area of 5.22 x 4.13m, these are some of the largest garden log cabins that we’ve seen that come with a price tag of less than two thousand pounds. 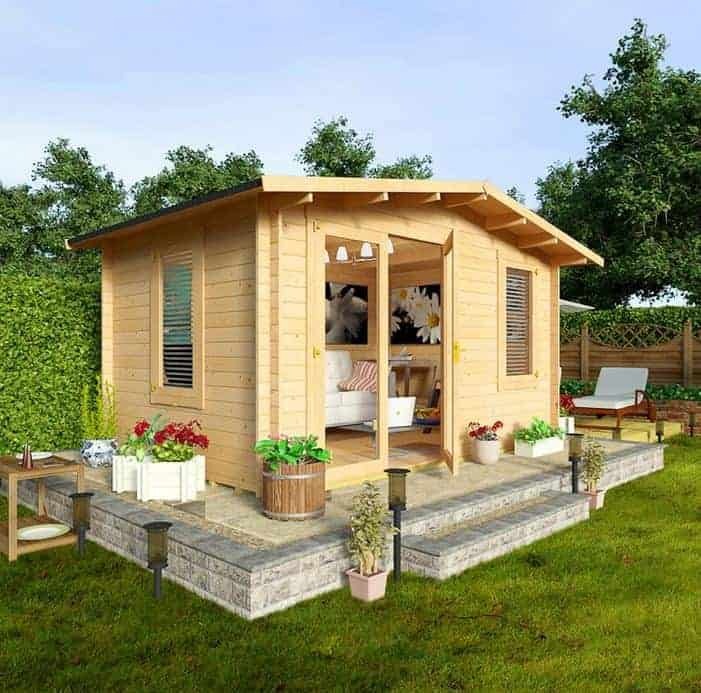 For this reason, we feel that these garden cabins should be added to the shortlist of anyone who is looking for a large and reliable log cabin but who is operating on a limited budget. It should be pointed out, however, that in common with most other BillyOh garden buildings we’ve reviewed, a floor isn’t included as standard. Adding one as an optional extra costs between £120 and £189.99, but even allowing for this we still feel that it is very good value for money. We were also impressed by the style of these garden log cabins, and from the moment we saw the pictures we could tell that it had been made to a very high standard. 28mm thick logs are used as standard, but there is an option to upgrade this if you want even more strength and stability. Extra protection from wind is provided by the integrated chalet connectors; they’re always a feature we like to see, as they not only serve a practical purpose they also add to the visual appeal of the garden cabin as a whole. 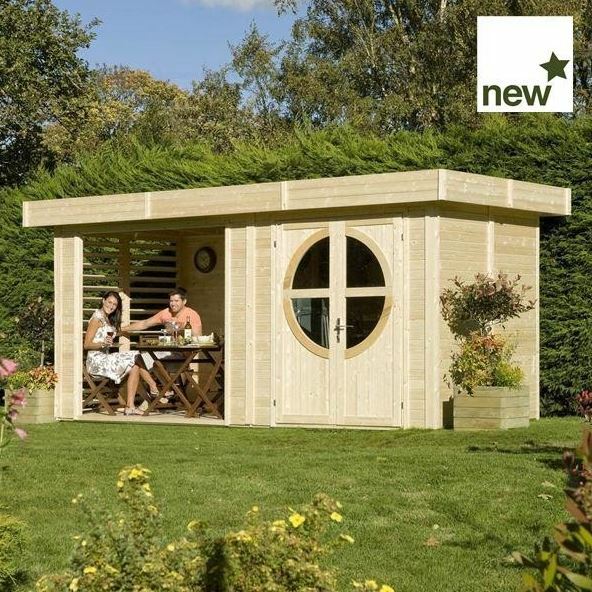 Just the name of Provence makes you think of sunny days spent amongst nature, and these garden log cabins are an ideal and low cost way to get the most out of sunny days spent in your garden. With a base width of 3.00m and a base depth of 2.00m, these certainly aren’t the largest garden cabins that we’ve seen, but there’s still enough room inside to set up some furniture that can be used either as a place to work from or simply as a place to relax at the end of a long day. The centrally positioned double doors open wide enough to make it easy to manoeuvre objects in and out, and we are sure you’ll be impressed by how much light reaches the interior thanks to the full glazing on them. There are no windows on the side panels of these garden log cabins, but we welcomed this design feature as it means that by careful positioning it can be very difficult for passers by to see what’s being kept inside. This makes it less likely that it will be targeted by thieves. Most of the garden cabins in our list have an apex roof of some kind, but this Provence cabin has a pent roof. The pitch still carries rainwater quickly away, and yet it looks less obtrusive. It’s a classic look that we really liked, and we also liked the good value price tag. This is the second of two corner garden log cabins to make it into our top twenty league table. It’s a little larger than the Rowlinson model we discussed earlier, with a base area of 4.34 x 2.96m, and yet it’s clever design still allows it to fit neatly into the corner of a garden, so preserving that precious lawn space. 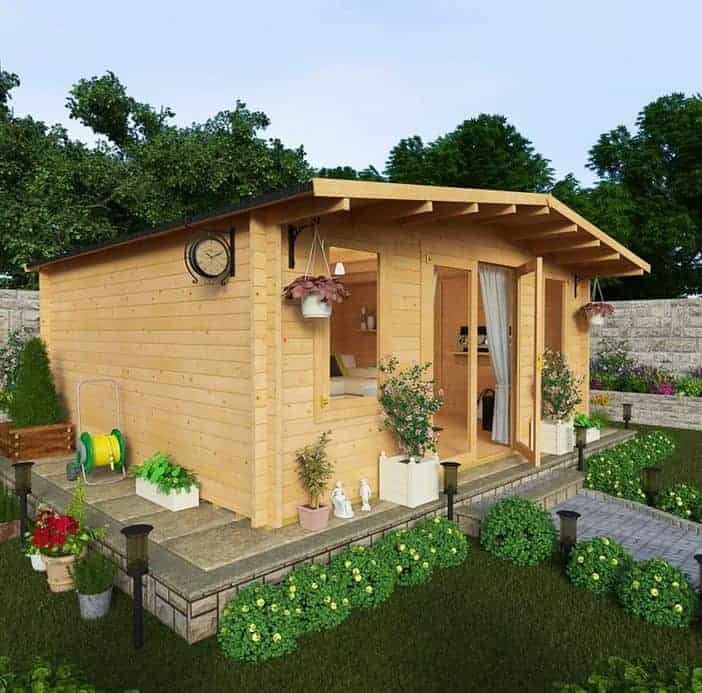 This GardenStyle cabin is also a little costlier, and it doesn’t come with an extended guarantee of any kind. These are the reasons that we’ve had to give it a lower ranking, although it’s still very deserving of its position within the top ten. These are some of the most stylish garden log cabins that we’ve seen, with the combination of high quality logs and Georgian style glazing really catching our eye. We also liked the shingle effect covering on the solid sheet roof. The floor too is made of solid sheet material, so you may want to think about strengthening this if you’re thinking of having heavier items of furniture inside. On the positive side, however, we were very pleased to find an integrated secure storage area that’s accessible by its own personnel door. 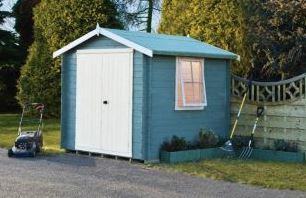 We very rarely find this in the garden cabins we review, and in effect it makes this an attractive cabin and a secure storage shed all in one. These large and tough garden log cabins can transport the Swiss Alps to your lawn, thanks to its classic design and the use of an overhanging apex roof. The base dimensions of 5.08 x 3.28m make them suitable for those who want to use their cabin for more than just relaxing in their garden. We can easily imagine these cabins being used as an office for those who work from home, or alternatively it can be used as a gymnasium or spa, or even guest accommodation for those who have a lot of visitors. One of the things that we liked most about these garden log cabins is that they come with lots of options to make them easily customisable. One option that we would heartily recommend is the addition of a floor, although this does impact on the overall value as it comes at a further cost of over four hundred pounds. A single or double annex can be added, as well as elegant continental style window shutters, and even window boxes for those looking for a less expensive way to add a little colour and originality. In effect, you can transform the standard model into the garden log cabin of your dreams. 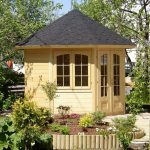 If you’re looking for garden log cabins that are sturdy and strong, and yet still have eye catching good looks, then these Ventoux cabins could be just what you need. Unlike most of the garden cabins that we review, these come with 34mm thick logs rather than the 28mm or 19mm that we’re more used to seeing. These extra millimetres can make a big difference, and so this would be a good choice for gardens that are in an exposed area that’s often subject to strong winds. We were pleased to find that chalet connectors were used on the corners as well, giving even more weather protection. We were struck by the amount of glazing used on the frontage of these garden log cabins, with two long opening windows being placed adjacent to the fully glazed double doors. It makes this an ideal garden building for sun lovers who want to make the most of the warmth that the British climate occasionally provides. It also means that the interior should be very well illuminated with natural light, which is an essential factor for people who want to install a desk inside and use their cabin as a home office. At not much more than two thousand pounds for a rectangular base area of 4.00 x 3.00m, we were also impressed by the value for money it provides. 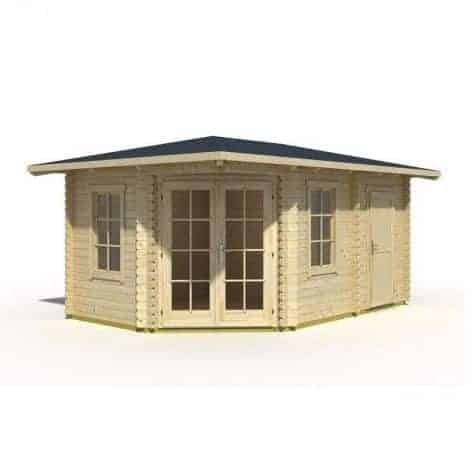 We’ve reviewed a wide range of garden log cabins from BillyOh, and we’re pleased to report that this 4.08 x 2.92m Montana model shares the positive qualities that we like about this manufacturer: it’s attractive to the eye, represents very good value for money when compared to similarly sized cabins from other manufacturer’s, and it is made from high quality components. It also, in common with its stablemates, comes without either a floor or an extended warranty, however, and this too has had to be taken into account when determining its final position within our WhatShed league table. Unlike many garden log cabins we see, this one has the double doors offset from the centre, with one window alongside them, and another around the corner on a side panel. It’s a very striking design that we really liked, and it also means that natural light is allowed to enter from two sides which should help to keep it illuminated for longer. The overhanging roof is another design feature that we appreciated, as it creates a pleasant shaded area on a hot sunny day, as well as giving added weather protection to both the cabin and its contents. With glazing, cladding, flooring and roofing options this can also be transformed into a luxury level garden log cabin. 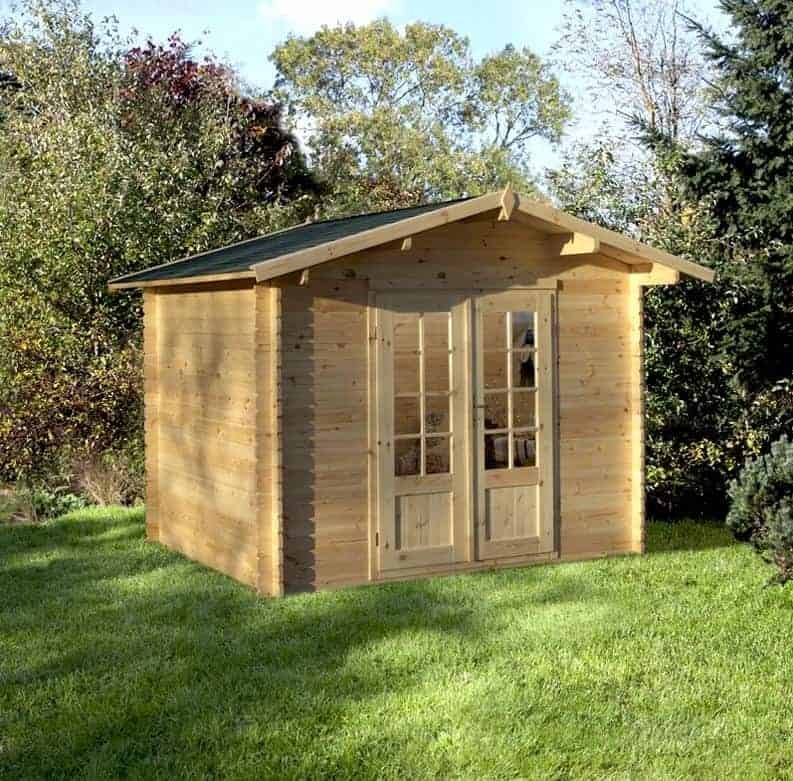 The Auvergne is a perfect example of what many people think of when they think of garden log cabins. It’s not too large, with a base area of 3.00 x 2.50, and it has centrally positioned double doors with an attractive Georgian style glazing. Chalet connectors help to protect the log cladding against windy conditions, and the apex roof offers more than adequate protection against rain and snow. The roof also has a significant overhang, projecting out for half a metre, forming a canopy at the front, which is very evocative of European chalets. We found the overall effect both charming and pleasing on the eye, although it won’t win any awards for originality. 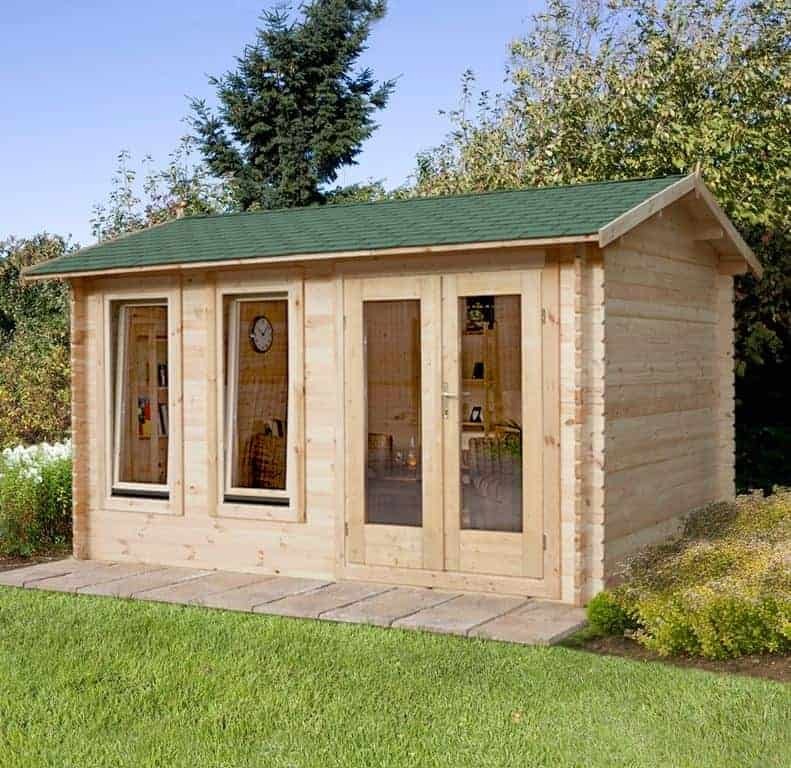 Once assembled, we would expect this to be one of the most sturdy and robust garden log cabins that we’ve seen with a comparable base area, and that’s thanks to the use of kiln dried logs for added strength, and their thickness of 28mm. The roof and floor are both thicker than we often see as well, at 19mm thick, so you won’t have to worry about the floor being able to cope with heavy furniture or even machinery. For those reasons we would expect these to be tough and durable garden cabins, although that will be reliant upon the owner adding their own wood preserver treatments on an annual basis. This is the smallest and also cheapest of the twenty garden log cabins to gain a place in our league table, and yet we were pleased to find that it still had a lot to offer in terms of both looks and performance. We found its compact cube like appearance, with the apex roof reaching a ridge height of 2.25m to go alongside the 2.09 x 2.09m base dimensions, rather eye catching, especially as it also features integrated chalet connectors. 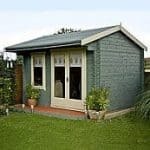 These relatively modest dimensions still provide more than enough room for one person to move around inside, and it’s therefore ideal for those who have a small garden but still want to enjoy the benefits that garden cabins provide. There’s a single hinged door at the front, and a single square window on a side panel. What we liked most about this window, and it’s something that we haven’t seen on other garden log cabins of a similar size or price, is that it comes with a wooden shutter. This not only looks stylish, it allows the window to be closed up, keeping the contents within the garden cabin safe from prying eyes. 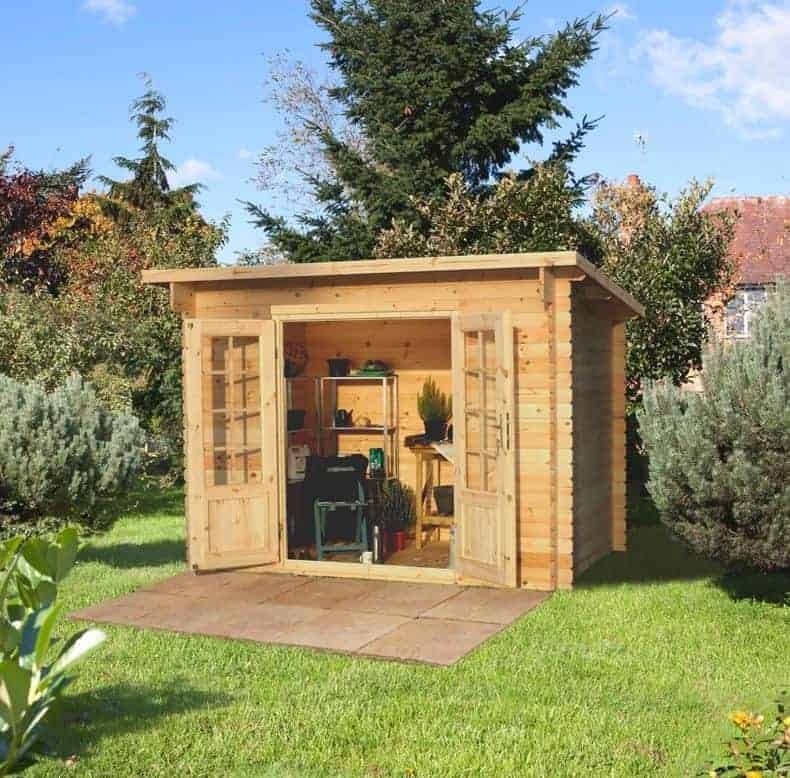 With an asking price of less than five hundred and fifty pounds, this is an ideal beginner’s garden log cabin which is why it earns a spot within our league table. These 3.51 x 2.82m garden log cabins have a reverse apex design, which not only caught our eye from the moment we saw the pictures, it also makes it a good choice for gardens that are wide and yet relatively shallow. The apex roof has a peak height of 2.47m, which is taller than many that we see, and this should help to create an interior that feels very spacious and therefore welcoming. It also means that there is lots of room for the installation of furniture and electrical equipment, which can really turn this into a home from home. The dominating feature of these garden log cabins is the set of double doors which are positioned at the left extremity of the front. They’re fully glazed, which with the addition of one further window means that there should be lots of light inside to work or relax by. We were impressed by just how roomy the doors were, with their opening width of 1.56m and height of 1.88m comparing favourably with most other garden cabins that we see. It means that moving even wide or bulky items in and out is easy, which in turn allows the owner to get the most out of their garden log cabin. The majority of garden log cabins that we review, and therefore the majority within this league table as well, are based upon a broadly square or rectangular base area. This is radically different, however, having an octagonal shape, and this exciting design helps it gain a place among the very best garden cabins that we’ve reviewed. 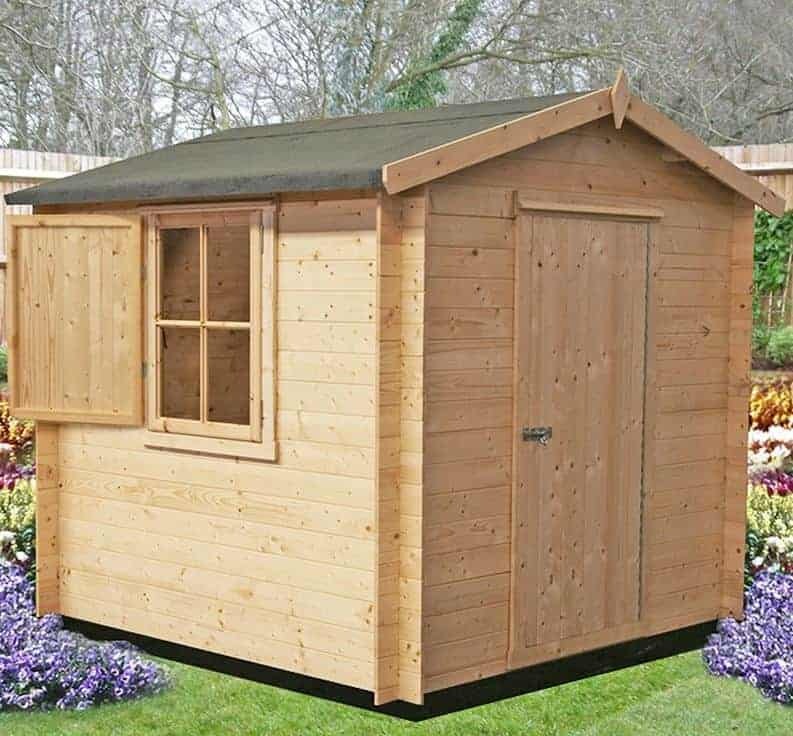 It’s not the cheapest cabin of this size, 2.90 x 2.90m at the base, that we’ve reviewed however, and in conjunction with its lack of an extended warranty this accounts for its relatively lowly ranking. 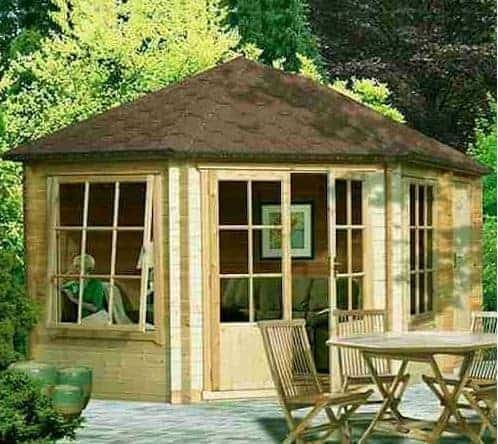 The eight sided design is more reminiscent of mid sized summer houses, but the use of 28mm logs is what distinguishes this as a garden log cabin. It’s also what makes this very strong, and we were glad to see that heavy duty flooring and roofing had been included as standard, as had a key operated lock on the double doors. Another feature that impressed us was the bitumen shingle covered roof, giving excellent protection against rain and snow as well as helping to make these garden log cabins even more visually appealing. This particular model has two windows, but with the glazed doors there was a plentiful supply of natural light. A four windowed version is also available. 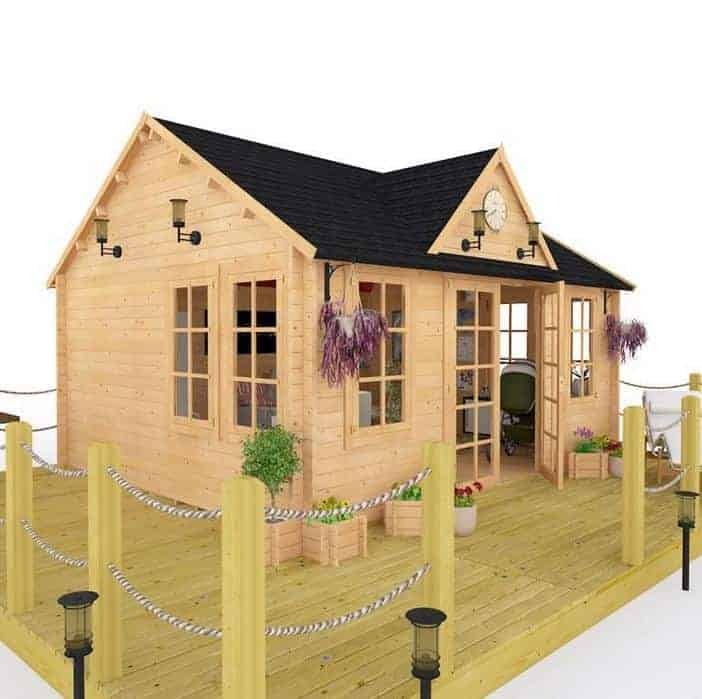 Out of all the garden log cabins we’ve seen, this has to be the most visually impressive, and when painted or stained and finished off with a decorative feature or two, this is sure to become a much loved centrepiece of any garden. The first thing that makes it so visually impressive was its size. We’re concentrating here on the 4.45 x 4.44m model as we feel that this represents the best comparative value for money in the range, but there are even larger models available. It’s also by far the tallest of the garden log cabins in this WhatShed league table, with the apex roof reaching a peak of 3.35m, or eleven foot. The roof is not only tall, it’s also stylishly designed and completely unique, thanks to its projecting front section that gives it the look of a church, or a village hall as the name suggests. We can imagine a round clock face being positioned here, as the perfect finishing touch. There’s lots of glass on three sides as well, which we feel makes these garden log cabins an ideal place to relax or to use as a lounge or games room. With so many positives, it’s only the lack of a floor and the price tag of over two and a half thousand pounds which stop it from being placed much higher up our list. These large and accommodating garden cabins from Estnest grabbed our attention for two reasons. The first of these was its eye catching design, with the double doors being placed on a diagonal cut away of the rectangular design, giving the shallow sloping apex roof above it an offset appearance. 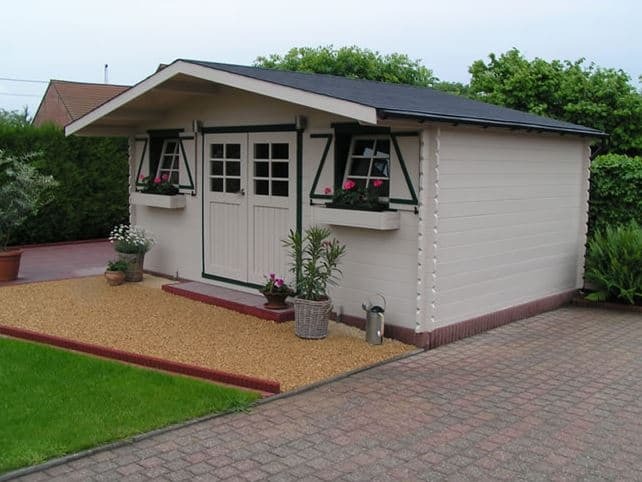 It’s very effective, as this was one of the most attractive large garden cabins that we’ve seen. What also impressed us from the moment we saw the pictures was the secure storage area at the rear of the cabin. Accessed through it’s own door, there are no windows opening onto it, and with a key operated lock as well it’s a very secure area. Whilst this storage area benefits from having no windows, we were pleased to find a square window on either side of the fully glazed doors. 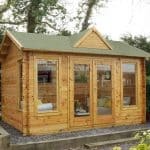 It means that the interior is should be very well illuminated, which is especially useful if you want to use these garden log cabins as a place to work from. As the windows can also be opened via a tilt and turn mechanism, ventilation can be quickly and easily supplied as well. We were also pleased to see a five year warranty supplied as standard, and in fact it’s only the larger than average asking price that prevents this garden cabin from obtaining a higher position. As we’ve seen from the other two occupiers of the bottom three positions, just because a building is towards the foot of our list of the very best garden log cabins doesn’t mean that it doesn’t have a lot to offer. This certainly confirms that, as it’s by far the largest garden cabin in our league table, which brings with it a huge amount of versatility. We found more than enough room inside for it to be used for multiple purposes, and with the right fixtures and fittings added we could easily imagine this being transformed into en suite guest quarters for example. The thing that really stood out with these garden log cabins is its overhanging canopy roof. It’s the longest that we’ve seen, and creates an extended and spacious outdoor area that’s both shaded and protected from the elements. We also liked the inclusion of rain stopping seals and guttering around the windows, which isn’t something that we always see on even the larger garden cabins we reviews. 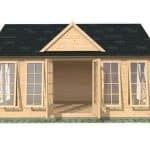 These pavilion style garden log cabins, then, have a lot to recommend them, but they are also easily the costliest models in our top twenty which is the only reason that they have to be content with the final position.